I was recently at Oracle Analyst World which is the vendor’s annual gathering of technology industry analysts. Its executives and others in the products organization deliver the latest news on where the titan is focusing efforts to expand its technology and markets. This year, against the background of the consumer and business markets embracing mobile and cloud computing, Oracle is working to sound like a more friendly supplier that can help remove legacy issues and inefficiencies that plague CIOs and data centers. Oracle also used this forum to attract IT departments to the technology advances it has made across its deep and broad portfolio of products. Oracle has more than 3,900 software products and more than 3,000 software patents that indicate its significant investment in R&D. Now the company is beginning to release improved products more frequently, which most customers now expect from technology vendors. To analysts Oracle emphasized four enterprise imperatives: big data, cloud computing, mobility and social media. These are among the six technology innovations our firm tracks – Oracle does not prioritize advancements in the other two at the top level, business and social collaboration and business analytics, although it offers products for them and are part of its significantly large product portfolio. There was significant time spent discussing their engineered systems of server, software and storage technology, which are targeted to transform data centers. This is a big-money center of opportunity for Oracle as IT organizations strive to streamline data processing and be more cost-effective in operations. Oracle also is furthering vertical integration of its technologies. Speakers invoked analogies to Steve Jobs and the innovative efforts of Apple, but that is really not a relevant comparison, as the dynamics of consumer markets do not translate to the business aspect of technology, whether it is rented by business units or purchased and installed by IT and are not as easily convinced about vertically integrated technology for business. The two constituents of business and IT and their approach to software continues to evolving differently, as I recently assessed. But even so my analysis of Oracle’s imperatives comes in the context of simplifying IT while pushing innovation. Let’s look first at big data, a market that continues to grow across the spectrum of technology used to capture, store and access business information. Our benchmark research on the topic finds that the RDBMS has reached a saturation point, being used in 80 percent of organizations, while other technologies have smaller penetration but will grow significantly until the end of 2015: in-memory databases (22%), Hadoop (20%) and data warehouse appliances (19%) all will be deployed in that time. Our research shows that the expanding volume, velocity and variety of data are important across types of big data technology, and Oracle is investing to ensure that IT organizations see it as a viable option for all of them. Oracle is embracing Hadoop broadly, from loading to data services, to ensure it can utilize the HCatalog metadata and Hive-based methods in its business intelligence efforts. The latest Oracle Big Data Appliance, Oracle Exadata and Oracle Exalytics, which include its BI software, are designed to serve organizations that have limited resources and time to fine-tune their configuration. In my analysis Oracle has not been as aggressive as it could be on communicating the value of big data and now in conjunction with its acquisition of Endeca is beginning to focus on what we call information optimization, which ultimately is the value derived from big data, as I have pointed out. I also think Oracle should look at more tightly coupling big data with its business intelligence and analytics to help business analysts in using large amounts of data. For example, the largest needs for big data according to our research are what-if analysis and forecasting (44%), predictive analytics (41%) and visualization (37%). Oracle has products for all of these, but they should be part of a more integrated presentation and technology stack for organizations to use them more easily. In both big data and business analytics overall, where Oracle has a broad portfolio of products, its acquisition of Endeca shows real promise, achieving advances in information discovery, interactivity and visualization as well as self-service access to information. Oracle is working to make its BI products as appealing to the business side as they have been to IT organizations but still needs to make clear the value to analysts, let alone those in managerial or management roles. 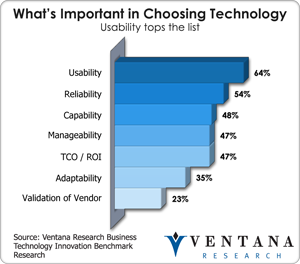 In this area improvements in the user experience are critical: According to our benchmark research usability is the top priority for organizations evaluating new software. My colleague Tony Cosentino recently covered Oracle’s latest release of business intelligence. He notes that it shows steps in the right direction but lacks integration or use of Oracle’s latest mobile and collaboration technology. 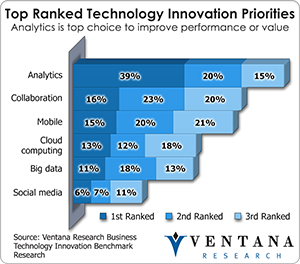 Here the company cannot rely on the perspective of IT, which does not consider these aspects important; our business technology innovation research shows that the lines of business have them as two of the top three priorities. Not much is new in the mobile aspects of Oracle BI, although I pointed out at the beginning of last year that it needed significant improvement and requires more frequent updates. Oracle also is slow in advancing its analytic applications across ERP, CRM, EPM for finance and industry-specific analytics; users in these areas need to transition from tools and dashboards of charts to applications that help not just measure performance but act on and manage it more effectively. Oracle has decided to concentrate its more advanced analytics and visualization on operating against the Oracle Exalytics appliance. This limited approach could hinder its potential as business analysts are less interested in having an appliance package than in tools and software they can use for business analytics with big data or not. For cloud computing, Oracle is beginning to see returns on its investments in a range of engineered systems that can operate across private or public clouds in single or multitenant approaches; the approach also encompasses storage through archiving data to its Oracle Virtual Networking. Along with IBM, followed by HP and Dell, Oracle is working to turn its range of software into a competitive advantage and appeal to a growing population in IT that realizes it must emphasize usability of technology to meet the next round of business on a more timely and continuous basis. In the realm of business applications, Oracle is working to support them in whatever combinations users want, even in a single organization. It has made its global data centers available for any level of demand on a 24-by-seven basis. With the acquisitions of RightNow and Eloqua it has become relevant in customer services and marketing applications. Oracle’s intention is to supercharge its efforts in the B2C markets and to provide more choices for customers. It has continued development of its Social Relationship Management and utilization of social media but but hasn’t caught up with point providers Attensity, Clarabridge and Kana. I believe Oracle will also need to address multichannel contact centers and the dynamic aspects of customer interactions. Mobile and social channels are driving a new generation of technology that Oracle is not now competitive with. At the analyst gathering I heard almost no references to its efforts in sales force automation and other sales-related tools where Salesforce is sharply focused and Microsoft is rapidly advancing. In our 2012 Value Index on Sales Applications Oracle showed a very competitive offering and earned a tie at the top spot, but it cannot afford to be complacent here. In fact Oracle’s Fusion for CRM in sales has integrated forecasting (65%) and analytics (47%) more tightly than Salesforce, addressing the top two priorities of sales organizations found in our Sales on the Cutting Edge research. Oracle is more effective in its suite of applications for human capital management (HCM), which has fully integrated its purchase of Taleo; it now has a convincing discussion of its cloud services to help HR and all employees be more efficient. Oracle also has progressed with its Fusion Applications; as I pointed out last year Oracle Fusion applications are now available in on-premises, hosted and software as a service (SaaS) methods. I like the innovation in the mobile technology that it is showing in areas like HCM. My largest concern is the continued lack of focus on the Office of Finance; Oracle’s enterprise performance management (EPM) application is still embedded within its middleware approach to BI and those in finance are most interested in business applications for their processes. Oracle’s potential to help Finance is significant but the split of its accounting and finance applications for management and operations remains a barrier that is an organizational challenge for Oracle than the buying audience readiness to advance its application portfolio. It is positive that Oracle has gone beyond just virtualizing or cloud-enabling its applications into in-memory processing to take advantage of the growing potential of computing and memory capacity. Oracle sees its ability to handle data cache and grid in-memory as a competitive advantage, and its Oracle Database 12c and TimesTen can take advantage of D-RAM and Flash. In-memory capabilities are also important for accelerating the performance of its BI offering, which can now operate in a variety of options with its caching methods. Its acceleration of investment into in-memory and other next-generation applications for business comes just in time, as SAP continues its investment into Hana to power its applications. Oracle at this point seems to have a more comprehensive approach than SAP but will need to get these applications deployed in more organizations and build its customer reference base. Also, faster is not always better, and the usability and interactivity of the applications with the business processes will determine its future success. For business and social collaboration, the Oracle Social Network is just beginning to roll out as part of its applications, which according to our research is how businesses would most prefer to access this type of software. With rollouts coming in HCM and SFA, the next year will critical for Oracle to build a strong reputation in this category; over the last decade it made many attempts to satisfy the business audience, which in the end cares about collaboration as a business technology and not as middleware, which is how Oracle has classified it. While many in the industry including IT analysts have not prioritized collaboration as important, this is more of a result to their focus on the IT organization and not one of the needs of business to collaborate and streamline their business processes and actions that require rapid coordination and dialogue. Oracle is smart to make collaboration part of its business applications first, as this is the most frequently selected deployment method in 43 percent of organizations, but other approaches including integrated with Microsoft Office (40%) and embedded as part of business intelligence (28%) or a stand-alone product (23%) are not far behind; we conclude that many organizations prefer a mixed approach. I like Oracle’s use of activity streams, broadcasting and discussion forums, all of which are part of the new evaluation criteria for social collaboration in business as we see a shift from the outdated approaches of just sharing folders and documents or posting links to files within a portal. Oracle’s offering is well integrated and now with collaboration being the second most important innovation priority in organizations, there is opportunity for Oracle if it can move forward faster with what I believe now is a good business and social collaboration software offering. As Oracle’s opportunity grows with its range of new applications and tools for big data and business analytics, its challenges lie in marketing and presenting them to the business buyers who are leading a new wave of technology adoption; these people want to be spoken to in the language of business and time to value and will not be patient with technobabble. If Oracle can communicate with them, business buyers will find more than perhaps they expect in the Oracle portfolio of products and its ability to help them work better. In the mid ’90s Lotus Notes and Domino led the market with the first true business collaboration and communications software. Today, after decades of fierce competition with Microsoft and its Office and SharePoint offerings, IBM is innovating (in a much more serious way than I have seen from Microsoft) to gain growth in the new market for business and social collaboration software. It is a good time for IBM to aggressively expand into the market, as our research finds only 25 percent of organizations are satisfied with their social collaborative capabilities. These have been dominated by shared folders and documents (86%), videoconferencing and instant messaging (66%), yet those applications are only a small piece of what social collaboration is about. IBM has been adding business collaboration features over recent years with new capabilities that include activity streams, broadcasting, instant messaging, videoconferencing and wikis. All are part of IBM Connections 4.5, along with content and document management. With IBM Docs people can collaborate on a range of documents, including spreadsheets, presentations and word processing. IBM has advanced the user experience and integrated its collaborative and social software into a unified user experience. IBM is also making the software available on Apple, Android and BlackBerry smartphones and tablets. Our research finds Apple to be the first-ranked priority for smartphones (50%) and tablets (66%), followed by Android on smartphones (27%) and tablets (19%). Though BlackBerry (which just announced the change in its corporate name from Research in Motion) is a distance third for smartphones, it still has a loyal following that also uses IBM software. Our research finds Microsoft at the bottom of business and IT buyers’ priority lists. IBM is also expanding its social collaboration support for mobile technology to operate in an offline mode which is essential and has also addressed the need to secure sensitive communications and content. IBM also maintains a strong installed base with Notes and Domino. IBM Notes and Domino Social Edition 9 is expected to be available in March and brings an innovative approach to blend social collaboration within electronic mail that many will really like IBM innovative approach. Businesses that do not use Notes, which make up the majority of the industry, can examine IBM Connections. IBM is also moving fast to ensure that its offering is available in cloud computing. IBM SmartCloud for Social Business will make it easier for organizations to get started and use the software without the need for servers, storage and other internal IT resources. This is an important step to bring its offering to a larger audience that may not have the IT resources or budget to support new business collaboration efforts. The software helps streamline the cultural transition to using social collaborative software. IBM has introduced adoption services with a range of models, processes and education. This investment is critical to get organizations to step into the new world of social collaboration and increase the confidence level of organizations in this approach; today only 17 percent are very confident and just 38 percent are confident. IBM has completed its acquisition of Kenexa, and at IBM Connect seemed to indicate it has settled on some specific areas of focus that blend learning and recruiting with social collaboration. It has taken steps since my analysis at the time of the acquisition to address many of my concerns. In addition, IBM introduced its new Employee Experience Suite, which is designed to provide an interface to business priorities and work like an employee portal. IBM also touted its new social learning offering, which when delivered will leverage its existing software and what the company purchased with Kenexa. I would like to have seen more on how to leverage Kenexa OutStart mobile learning. The potential in social learning is significant, and IBM’s product offerings put the company on a short list of providers who offer integrated social learning today. 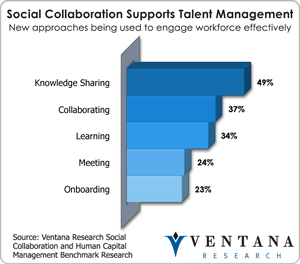 More broadly, IBM’s efforts to bring social collaboration to human capital management come at a time when our research into HCM shows that knowledge sharing, collaborating and learning are key priorities in organizations today. IBM will need to invest further to bring into IBM Connections more from Kenexa of what is needed in talent management in recruiting, performance and compensation. IBM has a great opportunity to expand its position with Kenexa recruiting customers that use both its software and its services and get them to use more IBM social collaboration and workforce analytics software. IBM spoke at the conference about its Smarter Workforce Analytics Suite, designed to address workforce analytics and predictive hiring analytics, but I did not see this software leveraging the company’s business intelligence or workforce analytics solutions. The tandem of this software foundation, the IBM Research and global business services organizations, and the analytic services of the Kenexa organization has the potential to advance the necessary process of moving off of spreadsheets to a dedicated business intelligence tool to meet the needs for workforce analytics and planning. 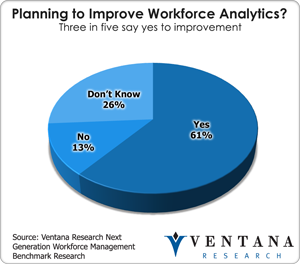 We have found in our research a significant move by businesses to improve workforce analytics in 2013, with 61 percent of organizations indicating they have plans in this area. Also most HR organizations are still working on advancing beyond the use of spreadsheets and reports indicating a lower level of maturity than what IBM might expect. This could be an opportunity for IBM if they fully utilize the core technology of its business analytics software and that I wrote about last year. I was impressed with IBM’s advancements in social collaboration at Connect 2013 and its commitment to usability, which our research found to be the highest priority (64%) in choosing technology, followed by reliability, since technology in use across an organization must be able to scale and perform. Organizations that have not considered IBM for social collaboration should examine the new version of Connections, since it offers a powerful set of unified capabilities that encompasses mobile technology. The top benefit to such software according to 72 percent of organizations in our research is better communications and knowledge sharing, and Connections has the power to deliver that. However, IBM should also embed its social collaboration features in other business applications, as that is still a preferred method of accessing collaboration according to 43 percent of organizations. One area that I expected to see more highlighted was its integration with IBM business analytics software which is one of the top use cases for using social collaboration in the enterprise and that IBM has integrated already. IBM is taking a significant step forward to bring Smarter Workforce into a highly competitive market for human capital management. This is confirmed in my colleagues (Stephan Millard) research agenda for human capital management, that the pace of innovation in 2013 will be significant. IBM new offerings and approach are ones to watch but make sure you are able to get something for use today in your business and not have to wait for the future. IBM is a vendor to watch for its ability to help organizations of all sizes with social collaboration and human capital management.